Is It Good? 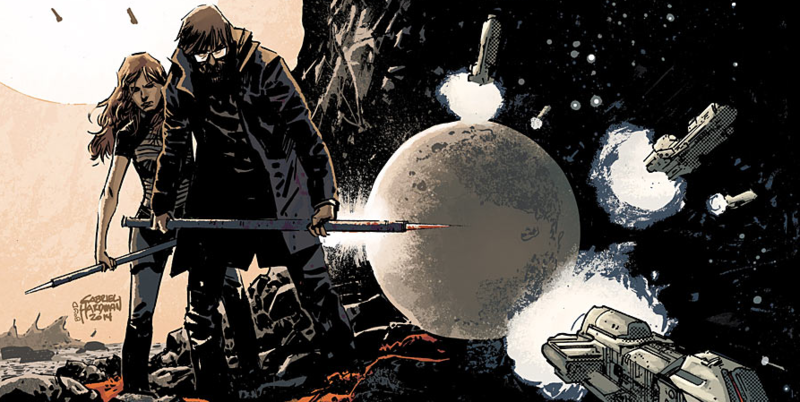 Invisible Republic #1 Review – AiPT! Sounds promising. Is it good? On March 18th the world will meet Croger Babb, a reporter living in a dystopian future in which a regime has recently fallen, plunging the world into poverty. Almost immediately after the book starts Croger discovers a journal belonging to a woman named Maia, the cousin of the man whose regime it was that fell. Through the pages of that journal, Croger begins to uncover the truth about Maia’s cousin, Arthur McBride. I have never seen this type of storytelling before in a comic. By telling the story through a reporter who’s reading someone else’s report of something, there’s mindtrickery reminiscent of Inception and it’s interesting to note the reactions Croger has to his findings. I imagine in future issues we will have several switches between the present and the time of the journal, creating a multi-leveled story. We can already see this begin to develop in the first issue. Invisible Republic starts off with a grimy, dreary looking landscape set in the present and the switches off to an almost tropical (yet just as grim) setting, creating a story that’s very easy to get sucked into. I suspect that Invisible Republic will be primarily a character study and will take a close look at Arthur McBride especially. I’m extremely excited to see what these characters are really about: Maia, Arthur and even Croger have displayed a range of emotions I wouldn’t normally think possible to explore in a single issue. This comic could not be more full of intriguing and gripping characters. There’s a distinct aura about Invisible Republic. It’s dark, it’s bitter, it’s clever and it’s brutal. The best way to understand this is from the dialogue between the characters; it’s very simple, with few fancy rhetorical devices. This makes the emotion all the more pronounced. The dialogue between the characters creates moments and subtleties that wouldn’t otherwise be there. I sometimes feel that dialogue can be a hindrance to many great comic books, but Invisible Republic benefits from it immensely. March 18th may just mark the beginning of a new era in comic books, incited by Invisible Republic #1. This book has revolutionary storytelling, captivating characters and a dark and intriguing personality. Comics don’t get much better than this.